Unfortunately people, especially children, go missing every day. There are a great number of methods in place to help find the missing BUT one very obvious method is totally ignored, not to say impossible until WrapMail developed its technology: email. Not email-blasts BUT using the emails people send every day anyway (one-on-one emails)! Corporate and Government employees send emails every day, these emails go to the public, businesses and government agencies but when they arrive they are plain black on white. Each of these emails could have a Wrap surrounding the email that in addition to information and links to the respective websites also could feature pictures of missing adults and/or children. 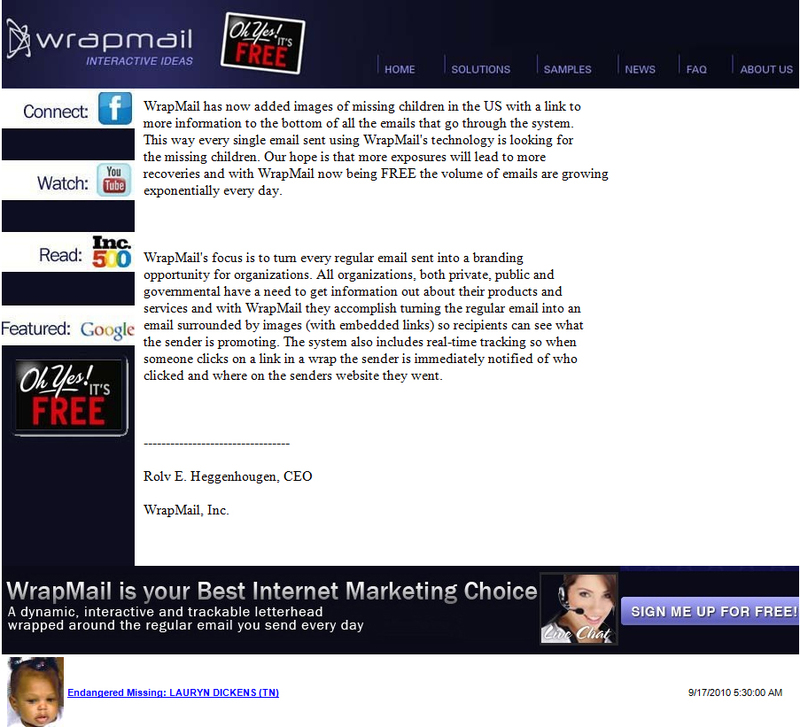 WrapMail, Inc.’s technology allows for dynamic rotation of content so that every single email that is sent out could feature new missing kids so that every single one is exposed to the receiving audience. There are already RSS feeds with data on missing kids that can be incorporated into a wrapped email. This is the milk carton of the 21st Century! 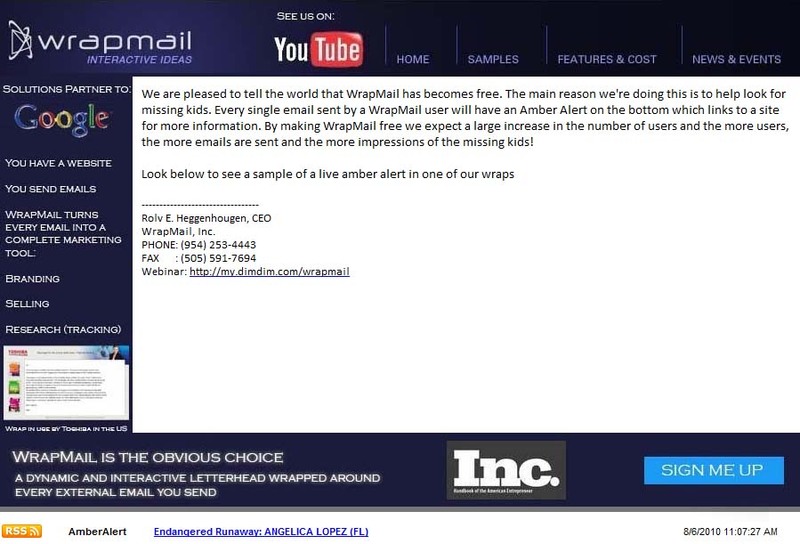 All emails that leave WrapMail, Inc. have an amber alert on the bottom, currently linking to missing children in Florida where WrapMail is headquartered. This RSS feed comes from the Center for Missing and Exploited Children. These pictures could have embedded hyperlinks that lead to pages with more details (such as more pictures, last seen, clothes worn, last seen with etc). There are about 50 billion emails sent every day; one-on-one emails that is, every one of them could be looking for missing children. The bottom line is that these emails are sent every day anyway – why not use them for something good? WrapMail offers their solution for free for approved organizations as they, like everyone else, send external emails every day. WrapMail offers its clients the ability to incorporate this feature for free, either with just an amber alert or a rotation of missing people with every outbound email. WrapMail also offers a free solution where users can set up a free email account and then build their own wrap with pictures and links.